The communities in which nonprofits operate have significant influence on the extent to which organizations can achieve their missions. A complex network of beneficiaries, funders, competitors, and collaborators surround nonprofits and foster their success or facilitate their decline. Leadership has a responsibility to understand who the important actors are, how quickly changes in the market occur, and how volatility will impact the organization’s business model and long-term sustainability. Please view our training, workshop, and consulting services outlined below designed to strengthen your organization’s ability to analyze market segments. The environment in which nonprofit organizations operate seems constantly in flux. Shifting political landscapes and funder priorities have led to calls for more collaboration and mergers, “collective impact,” and self-sustaining nonprofits. Add to this the changing needs of constituents and demographic shifts affecting both constituents and donors, and it is easy to see how nonprofit leadership can be overwhelmed when thinking about their community. Nonprofit markets consist not only of constituents who benefit from programs, but also funders who pay for them. 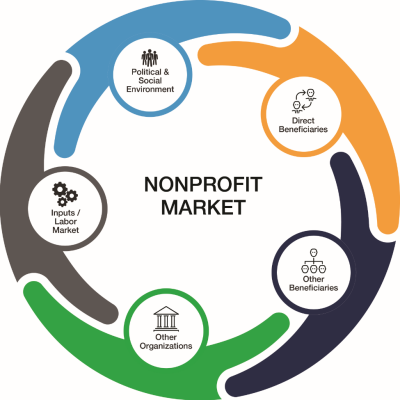 A holistic view of the market in which a nonprofit organization operates also needs to include the landscape in which organizations: other for-profit, nonprofit and public organizations working side-by-side as well as those whose approaches differ and compete with the organization for resources, talents and impact. Likewise, a mix of programs, their effectiveness, and their sustainability can be influenced by the availability of skilled labor and the political and social environment. A true market analysis needs to explore all of these influences at some level. This session explores each aspect of the market in more detail and offers a framework to conduct a market analysis. Board and staff together will be able to assess all elements collectively and paint a complete picture of the nonprofit’s market. Then, using the internal assessment, board and staff members can engage in discussion and decision making about strategic priorities and how best to structure the operations of the organization to achieve impact and strengthen sustainability. Identify and describe components of the nonprofit marketplace. Specifically define their own market using the analysis framework. Begin prioritizing deeper analysis of different market components by assessing changes in the market and predicting their effect on the organization’s business model. Leveraging the concepts defined in the breakout session, this workshop provides participants the opportunity to apply the theoretical foundation of market analysis. By first prioritizing analysis, participants will drill down on the most dynamic components of their individual market, and begin learning more about these changes. Break down the high priority components of the market to address the most pressing external influences. Determine how and when to use market data to inform strategic decision making. Define how external influence may affect the organization’s business model. In today’s dynamic environment, nonprofits need business models that can evolve quickly to changing community needs. Building off of the market analysis concepts described above, this interactive training introduces participants to the matrix map, an engaging tool that turns an organization’s business model into a dynamic visual integrating the mission impact and financial viability of the organization. Beyond just a picture though, the matrix map offers strategic inquiries for board and staff to frame choices and make the necessary and, at times difficult, adjustments to strengthen their business model and pursue nonprofit sustainability. Participants will leave with a tool they can use immediately to engage staff and board in this pursuit. This session is designed to provide an overview of our theory around sustainability and blend key concepts and tools of market analysis with the organization’s strategy and business model. Understand the concepts of sustainability, the nature of nonprofit business models and how their activities work together to create a sustainable organization. Be familiar with the matrix map – a visual tool for depicting an organization’s business model. Begin to analyze their business model and articulate the strategic inquiries to strengthen it based on the matrix map.